After about 145 days on the market, our Century Home flip is officially sold! We couldn’t be happier that the home went to a younger gentleman that is moving to Cleveland from the East Coast. We did – a little bit. The trouble with the Century Home was that it’s big and, while it is in a good suburb, it’s on the periphery of the more desirable areas. As a rule, my partners and I target flips with a net return of 30%. If it’s less than that, we don’t want to take the risk. This one came in well below that, but thankfully we still managed to turn a little profit. The chart below shows a general split of how it all worked out. 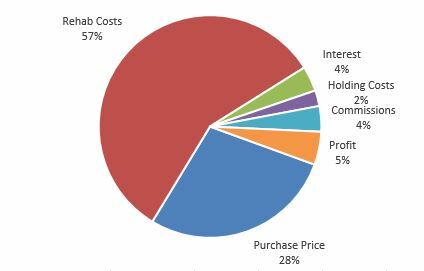 Rehab costs ate up 57% of total proceeds, with the purchase price taking up another 28%. Those are our “Hard Costs.” Rehabbers generally have a good sense of how to estimate those. What many newbie flippers forget, however, is that there are soft costs, as well – interest, commissions on the sale, insurance, taxes, lawn maintenance, snow removal, utilities, etc. Are we happy with 5%? No, not at all – but, you win some and you lose some. It’s a numbers game. The goods news is, we’re back at it – we’ve got two properties under contract and we can’t wait to tell you about them!